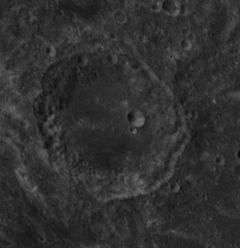 For the lunar crater, see Al-Biruni (crater). For the university, see Al-Beroni University. Abū Rayḥān Muḥammad ibn Aḥmad Al-Bīrūnī (Chorasmian/Persian: ابوریحان بیرونی‎‎ Abū Rayḥān Bērōnī; New Persian: Abū Rayḥān Bīrūnī) (4/5 September 973 – 13 December 1048), known as Al-Biruni (Arabic: البيروني‎‎) in English, was a Khwarezmian Iranian Muslim scholar and polymath. Al-Biruni is regarded as one of the greatest scholars of the medieval Islamic era and was well versed in physics, mathematics, astronomy, and natural sciences, and also distinguished himself as a historian, chronologist and linguist. He was conversant in Khwarezmian, Persian, Arabic, Sanskrit, and also knew Greek, Hebrew and Syriac. He spent a large part of his life in Ghazni in modern-day Afghanistan, capital of the Ghaznavid dynasty which was based in what is now central-eastern Afghanistan. In 1017 he traveled to the Indian subcontinent and authored Tarikh Al-Hind (History of India) after exploring the Hindu faith practised in India. [lower-alpha 1] He was given the title "founder of Indology". He was an impartial writer on customs and creeds of various nations, and was given the title al-Ustadh ("The Master") for his remarkable description of early 11th-century India. He also made contributions to Earth sciences, and is regarded as the "father of geodesy" for his important contributions to that field, along with his significant contributions to geography. He was born in the outer district of Kath, the capital of the Afrighid dynasty of Khwarezm (now in Uzbekistan) (or Chorasmia). 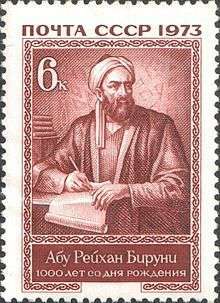 The word Biruni means "from the outer-district" in Persian, and so this became his nisba: "al-Bīrūnī" = "the Birunian". He spent the first twenty-five years of his life in Khwarezm where he studied Islamic jurisprudence, theology, grammar, mathematics, astronomy, medics and other sciences. The Iranian Khwarezmian language, which was the language of Biruni, survived for several centuries after Islam until the Turkification of the region, and so must some at least of the culture and lore of ancient Khwarezm, for it is hard to see the commanding figure of Biruni, a repository of so much knowledge, appearing in a cultural vacuum. He was sympathetic to the Afrighids, who were overthrown by the rival dynasty of Ma'munids in 995. He left his homeland for Bukhara, then under the Samanid ruler Mansur II the son of Nuh. There he corresponded with Avicenna and there are extant exchanges of views between these two scholars. In 1017, Mahmud of Ghazni took Rey. Most scholars, including al-Biruni, were taken to Ghazni, the capital of the Ghaznavid dynasty. Biruni was made court astrologer and accompanied Mahmud on his invasions into India, living there for a few years. Biruni became acquainted with all things related to India. He may even have learned some Sanskrit. During this time he wrote the Kitab ta'rikh al-Hind, finishing it around 1030. Ninety-five of 146 books known to have been written by Bīrūnī were devoted to astronomy, mathematics, and related subjects like mathematical geography. 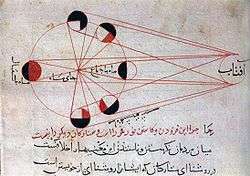 Biruni's major work on astrology is primarily an astronomical and mathematical text, only the last chapter concerns astrological prognostication. His endorsement of astrology is limited, in so far as he condemns horary astrology as 'sorcery'. In his major extant astronomical work, the Mas'ud Canon, Biruni utilizes his observational data to disprove Ptolemy's immobile solar apogee. More recently, Biruni's eclipse data was used by Dunthorne in 1749 to help determine the acceleration of the moon and his observational data has entered the larger astronomical historical record and is still used today in geophysics and astronomy. Al-Biruni contributed to the introduction of the experimental scientific method to mechanics, unified statics and dynamics into the science of mechanics, and combined the fields of hydrostatics with dynamics to create hydrodynamics. Bīrūnī also devised his own method of determining the radius of the earth by means of the observation of the height of a mountain and carried it out at Nandana in Pind Dadan Khan (present-day Pakistan). Biruni's main essay on political history, Kitāb al-musāmara fī aḵbār Ḵᵛārazm (Book of nightly conversation concerning the affairs of Ḵᵛārazm) is now known only from quotations in Bayhaqī’s Tārīkh-e masʿūdī. In addition to this various discussions of historical events and methodology are found in connection with the lists of kings in his al-Āthār al-bāqiya and in the Qānūn as well as elsewhere in the Āthār, in India, and scattered throughout his other works. An example of Al-Biruni’s analysis is his summary of why many Hindus hate Muslims. He explains that Hinduism and Islam are totally different from each other. Moreover, Hindus in 11th century India had suffered through waves of destructive attacks on many of its cities, and Islamic armies had taken numerous Hindu slaves to Persia which, claimed Al-Biruni, contributed to Hindus becoming suspicious of all foreigners, not just Muslims. Hindus considered Muslims violent and impure, and did not want to share anything with them. Over time, Al-Biruni won the welcome of Hindu scholars. Al-Biruni collected books and studied with these Hindu scholars to become fluent in Sanskrit, discover and translate into Arabic the mathematics, science, medicine, astronomy and other fields of arts as practiced in 11th century India. He was inspired by the arguments offered by Indian scholars who believed earth must be globular in shape, which is the only way to fully explain the difference in daylight hours by latitude, seasons and earth's relative positions with moon and stars. At the same time, Al-Biruni was also critical of Indian scribes who he believed carelessly corrupted Indian documents while making copies of older documents. Al-Biruni's translations as well as his own original contributions reached Europe in 12th and 13th century, where they were actively sought. In June 2009 Iran donated a scholar pavilion to United Nations Office in Vienna which is placed in the central Memorial Plaza of the Vienna International Center. 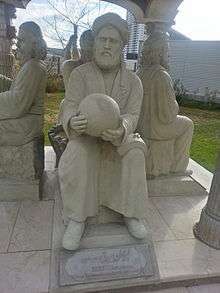 The Persian Scholars Pavilion at United Nations in Vienna, Austria is featuring the statues of four prominent Iranian figures. Highlighting the Iranian architectural features, the pavilion is adorned with Persian art forms and includes the statues of renowned Iranian scientists Avicenna, Abu Rayhan Biruni, Zakariya Razi (Rhazes) and Omar Khayyam. 1 2 The Exact Sciences, E.S.Kennedy, The Cambridge History of Iran: The period from the Arab invasion to the Saljuqs, Ed. Richard Nelson Frye, (Cambridge University Press, 1999), 394. M. A. Saleem Khan, "Al-Biruni's discovery of India: an interpretative study", iAcademicBooks, 2001. pg 11: "It is generally accepted that he was Persian by origin, and spoke the Khwarizmian dialect"
A.L.Samian, "Al-Biruni" in Helaine Selin (ed. ), "Encyclopaedia of the history of science, technology, and medicine in non-western cultures ", Springer, 1997. excerpt from page 157: "his native language was the Khwarizmian dialect"
1 2 3 D.J. Boilot, "Al-Biruni (Beruni), Abu'l Rayhan Muhammad b. Ahmad", in Encyclopaedia of Islam (Leiden), New Ed., vol.1:1236–1238. Excerpt 1: "He was born of an Iranian family in 362/973 (according to al-Ghadanfar, on 3 Dhu'l-Hididja/ 4 September — see E. Sachau, Chronology, xivxvi), in the suburb (birun) of Kath, capital of Khwarizm". Excerpt 2:"was one of the greatest scholars of mediaeval Islam, and certainly the most original and profound. He was equally well versed in the mathematical, astronomic, physical and natural sciences and also distinguished himself as a geographer and historian, chronologist and linguist and as an impartial observer of customs and creeds. He is known as al-Ustdadh, "the Master". ↑ Philosophy, Journal of Islamic. "Biographical Encyclopedia of Islamic Philosophy". Journal of Islamic Philosophy. 3: 127–128. doi:10.5840/islamicphil2008310. ↑ D. N. MacKenzie, Encyclopaedia Iranica, "CHORASMIA iii. The Chorasmian Language" "Chorasmian, the original Iranian language of Chorasmia, is attested at two stages of its development..The earliest examples have been left by the great Chorasmian scholar Abū Rayḥān Bīrūnī. ↑ Bīrūnī, Muḥammad ibn Aḥmad (1910), "On the Hindus in General, as an Introduction to Our Account of Them", Alberuni's India: An Account of the Religion, Philosophy, Literature, Geography, Chronology, Astronomy, Customs, Laws and Astrology of India about A.D. 1030, 1, London: Kegan Paul, Trench, Trübner, p. 17, see also Vol 2 of Al-Biruni's India. ↑ Yasin, , Mohammad. (1988). Reading in Indian history. New Delhi, India: Atlantic Publishers & Distri,. p. 19. ISBN 978-8-1715-6120-9. Retrieved 22 June 2016. ↑ David Pingree, BĪRŪNĪ, ABŪ RAYḤĀN ii. Bibliography, in Encyclopaedia Iranica.